"Then there were only two" frequently describes the state of the Japanese automobile manufacturing industry. They are Toyota and Honda, the only purely indigenous entities left in the industry. And both are doing admirably, being the envy of the others who have received varying injections of foreign capital. Honda's Dualnote four-seat sports car uses twin motors driving the front wheels to start, and a midship-mounted 3.5-L V6 assists with the rear wheels for 298-kW (400-hp) output and 18 km/L (42 mpg) fuel economy. Honda's "reference, experimental," or, more simply, concept vehicles are again a mixture of blue-yonder dream cars and very-close-to-production models. The Dualnote belongs to the former, although its IMA (integrated motor assist) IC-engine/electric-hybrid technology may power a future upscale car model. It is a midship-engine, four-seat sports car that packs a combined 298 kW (400 hp) from an experimental quad-camshaft, 3.5-L V6 and three electric motors. The V6-IMA unit, the engine assisted by one of the electric motors, is mounted aft of the four-seat cabin and in front of the rear axle driving the rear wheels. The other two motors drive each of the front wheels. Electric energy is stored in an ultracapacitor instead of the production Insight's and the forthcoming Civic IMA's nickel/metal-hydride battery. The ultracapacitor delivers an instantaneous electric "wallop" to the motor(s), which is its strength. Unproven in the real world at this time is its reliability and durability, according to a Honda engineer, who added that time would solve any shortcomings as with other innovations. The car moves off on electric power provided by the twin motors up front. If the capacitor is short of stored energy, the engine quickly takes over. Once on the move, the engine drivesvia an unspecified transmission typethe rear wheels. During rapid acceleration and cornering, the integrated rear motor generates electricity that is fed to the front motors, adding driving torque to the front wheels that is optimally split between the left and right wheels for speed and stability. It is ultimately an all-wheel-drive system, but not the first of its kind. Toyota already has a sophisticated hybrid all-wheel-drive system, employing primary front drive by an IC/electric motor and CVT combination and on-demand rear drive by a single motor in the series-production Estima minivan. Honda has taken it a step further in this concept vehicle with the twin-motor front drive. For situations such as downhill cornering, the individual front motors act as electric brakes, at the same time regenerating energy to be stored in the capacitor. Accommodation is more like in a rear-engine Porsche, being only slightly roomier for two people or luggage in the back. The Dualnote is no compact, at 4390 mm (173 in) long, 1830 mm (72 in) wide, on a 2870-mm (113-in) wheelbase. It is fitted with 225/45ZR18 front and 255/45ZR19 rear tires. Honda's aim is to obtain exceptional 18 km/L (42 mpg) fuel consumption with the aid of the V6 IMA and the car's light mass and slippery shape. Two folding mini scooters can be carried in the doors of Honda's semi-transparent box with truss frame structure called the Unibox. 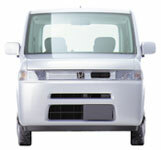 Another Honda creation is the Unibox, a massive box on six wheels built around a lightweight truss structure. Outer panels are transparent and of an "advanced" polycarbonate plastic, according to Honda, which are bolted onto the frame. Honda says it would oblige the customer's preference of less or non-transparent materials for the bodywork, if that unlikely event should ever occur. The Unibox is propelled by the I4 engine-IMA system driving the front wheels and is steered by a joystick. The latter is a serious endeavor at Honda, with a number of Accords circulating its proving ground with different system permutations, including steering-only and steering/acceleration/braking varieties. Another innovative, yet-to-be-proven feature is a road wheel incorporating a rubber ring that absorbs and damps surface irregularities and acts as an integral part of the vehicle's suspension system. Honda is now actively promoting synergy among its automobile, motorcycle, and power equipment R&D centers. The motorcycle center has produced two electric scootersthe Mobimoba and Caixathat fit neatly within the rear sliding doors of the Unibox, and the power equipment center provides an electric shopping cart with a navigation system (in case you are lost in a shopping mall) and a generator. Two e-DAX electric motorcycles provide rear seating for Honda's Bulldog. The Bulldog is the name fondly remembered by Honda small-car enthusiasts that was given to a furious turbocharged version of the tall urban runabout City. The latter-day Bulldog concept is no less purposeful in looks, but like a good citizen is powered by the forthcoming Civic Hybrid's I4-IMA powertrain. The tall hatchback is a 2+2, the rear two passengers accommodated on the seats of two e-Dax folding electric scooters; that is synergy. Honda's wic prototype will soon reach production. A car carries people, so it must optimize people space. Honda's wic (short for "What is car?") is labeled a "prototype," so it is destined for the assembly line soon. The five-door car conforms to Japanese light-car specifications. The SUU (Smart, Urban, and Useful) is based on the Civic platform. 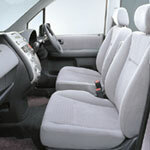 Its product concept is "Small Max" and is shared by the wic light car. Like the light car, the SUU body is within Japanese small-car limits, with overall width held to 1685 mm (66 in). The 1750 mm (69 in) tall vehicle has three-row seating for up to seven people, whose entry and exit are through front-hinged and rear sliding doors. The SUU is the second of Honda's Small Max theme and is based on the Civic platform. As a production-vehicle aside, the Civic Hybrid is Honda's second and (first) volume IC-IMA hybrid car. It is based on the Civic four-door sedan and was launched this fall in Japan; it will be brought to the U.S. in the spring of 2002. The new IMA is more powerful than that of the Insight; the internal-combustion engine is the new inline four-cylinder, 1.3-L, i-DSI lean-burn, the numeral representing engine displacement and i-DSI for intelligent Dual Spark Ignition. The twin-spark-plug ignition employs staggered firing to ensure combustion of lean mixtures. The VTEC technology allows the valves of three of the four cylinders to be deactivated (fully closed) on deceleration, thus halving pumping loss. A thin dc brushless motor assists the engine on rapid acceleration and also helps cancel vibrations generated during single-cylinder deceleration. The storage battery is a Panasonic nickel/metal-hydride type with cylindrical cells and is placed behind the rear seatback, leaving ample luggage space. The transmission is Honda's steel-belt-and-pulley-type CVT. Honda claims 29 km/L (68 mpg) fuel consumption on the Japanese urban cycle, an improvement of 45% over the conventionally powered Civic 1.5.